Here’s some interesting information for British model fans - the ModelZone chain is adding new outlets to its already extensive number of stores. The new expansion will cover Birmingham, Ipswich, Leicester and Glasgow, with more to come. It’s an encouraging sign that points the way to a good future for the hobby. ModelZone markets a wide array of miniatures, from plastic kits and model trains to sci-fi collectibles and slot-car racers. There isn’t a vast range in any particular genre, but the sheer variety means that there is a tasty ‘Aladdin’s Cave’ flavour to these stores, and it’s almost impossible to leave without purchasing something pleasing. An exploration is highly recommended! 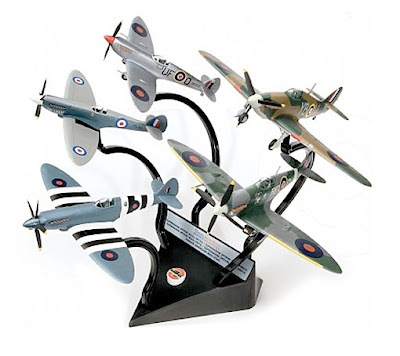 Among products available at the moment is the Airfix 1:72 scale ‘Fighter Collection’ set, featuring five World War II aircraft: four Spitfires of various types, plus a Hawker Hurricane and a big stand. As you can see from the pic, the finished group looks pretty impressive. 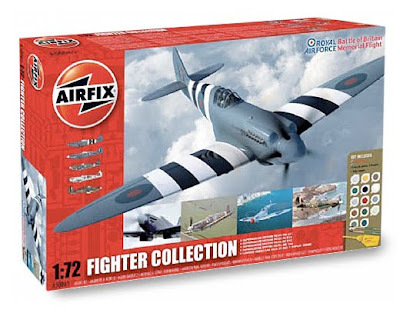 As is normal with these Airfix gift sets, you also get pots of paint, though how useful these are to serious model makers is another issue - at least they might come in handy for the touch-up collection. 2 Airfix Fighter Collection box. 3 The five-aircraft set, mounted on a very neat included stand. You can view a selection of other Spitfires here.